List of 95 news stories. 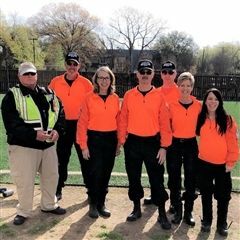 All week from March 25-29, DIS celebrated Safety Week. 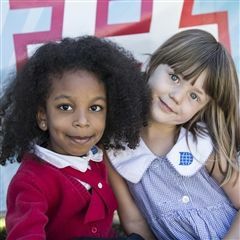 Caroline Wolfe came to Dallas International School at the tender age of three years old. DIS and The Globe continue to spotlight excellence amongst our students, this time with 10th grader, Li Henderson. The benefits of being bi/multilingual are numerous. 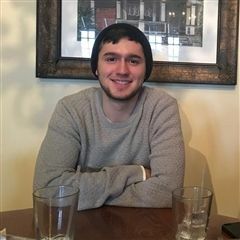 Philippe Jenkin began here at DIS in PS and continued throughout middle and high school as a Tigre, graduating in 2016. 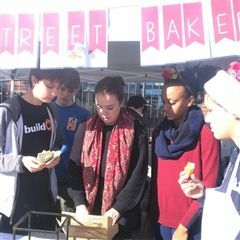 On Sunday, December 2nd, the middle and high school students from DIS's buildOn Club held a stand at the Marché de Noël (Christmas Market). 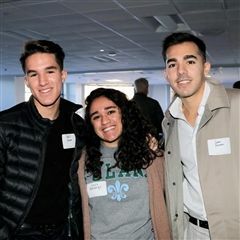 On Sunday, December 2, 2018, DIS and the Alliance Française de Dallas held the fifth annual Marché de Noël (Christmas Market) at the Dallas International School's Waterview campus. 775 million people in the world can not read or write. 57 million children do not have access to a school. DIS is home to a Tech Titan! 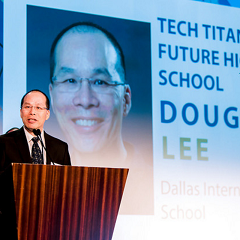 Our very own Douglas Lee, DIS Director of Technology / Computer Science & Engineering, received the High School Math/Science Teacher Award at the Tech Titans Awards Gala on August 24th. 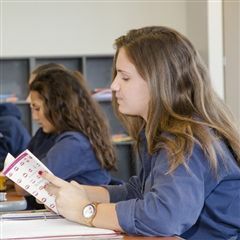 ﻿Immersing students in French and other foreign languages from pre-kindergarten through 12th grade, DIS offers children an education that is classical yet innovative and flexible yet focused. To further the joint mission of DIS and non-profit BuildOn to give the gift of education to impoverished areas of Haiti, secondary students have conducted a school supply drive that has yielded many donations and important life lessons. ﻿For many years, Dallas International School has partnered with BuildON, a nonprofit organization, to build schools in impoverished areas of Haiti. It has been announced that the newest school built in Haiti will be dedicated to Tracy Kozah, a fixture of the DIS community who served as the director of public relations and development at the school for over a decade. 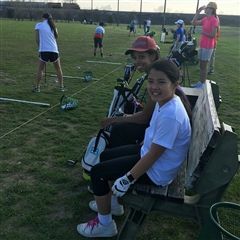 The golf program at DIS is rather new, but Tigre golfers are already winning tournaments and benefitting greatly from their participation. Eric Corticchiato is a DIS parent, successful business owner and a member of the DIS board. 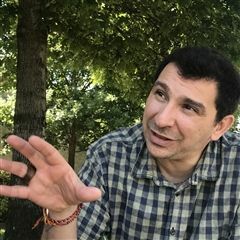 He has also traveled to Haiti three times with his family to support DIS' mission to build schools in the country, loves soccer, plays tennis and goes hiking whenever he can. 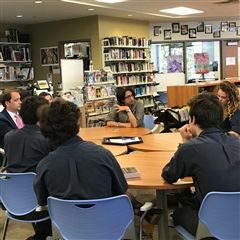 Dr. Siva Kumari, Director General of the International Baccalaureate Organization, visited the Waterview campus to learn more about the innovative way that DIS has implemented the Advanced Bilingual IB Diploma. 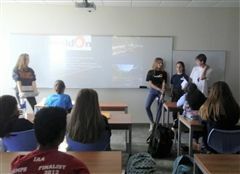 She also chatted with IB students and teachers to learn more about their experience with the program. From Shakespeare performances to poetry nights to an annual Multilingual Theater Festival, DIS offers some exciting options to students who want to pursue theater. 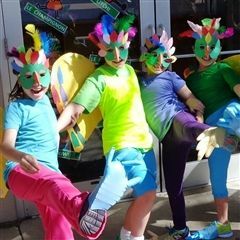 Learn more about why theater is important to education and how it supports the DIS curriculum. 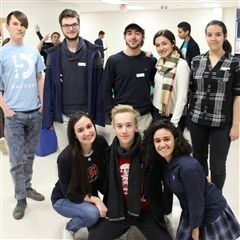 The Advanced Bilingual IB Diploma, which combines the universally recognized demanding nature of the classic IB diploma with a high level of mastery of the English and French languages, we first introduced as part of a pilot program at DIS in 2016 and will now be offered at DIS indefinitely. Truly, DIS has been recognized for its innovative efforts on a global level. 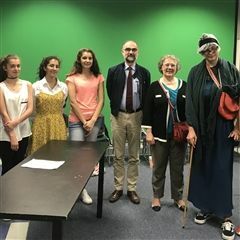 ﻿Last week, two inspectors from the French Ministry of Education, Mrs. Michèle Weltzer and Mr. Antoine Mioche, came to visit Dallas International School for a special purpose. 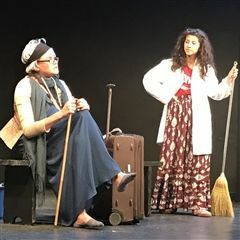 The DIS theater students were joined last week by their peers from French sister schools across the nation for the annual Multilingual Theater Festival, hosted by Dallas International School and held this year at the Dallas Children's Theater. 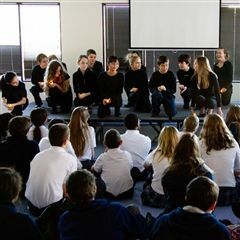 Students participated in special workshops to improve their performance skills, listened to professional guest speakers and even got to perform their own plays in front of a packed house. 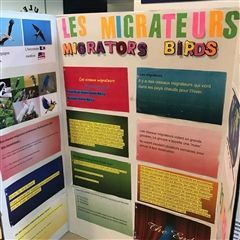 The Churchill campus recently held a one-of-a-kind bilingual science fair complete with dual language presentations by the students that utilized QR code scanning technology to allow parents to view the presentation in both English and French. 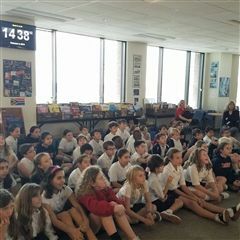 Churchill students worked together with storyteller and actor Kamel Zouaoui to perform, record and replay a class play. 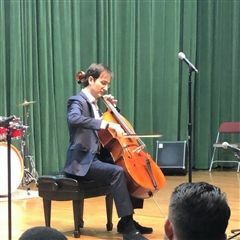 Kamel later stopped by to perform for the secondary students at Waterview and also the DIS theater students at the Multilingual Theater Festival. 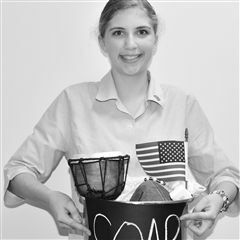 Kyra Naylor is a graduate of the Dallas International School class of 2016 and is currently studying at Southern Methodist University. As she finishes up her sophomore year at university, we sat down with her to learn more about her future plans and past successes as a DIS Tigre. What do Mandarin Chinese, hip-hop dance, and emoji design all have in common? They’re all among the wealth of offerings at the Dallas International School’s Summer Enrichment Camp! 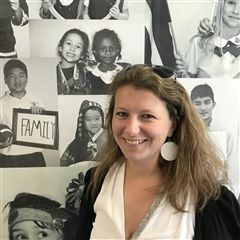 Ms. Clémence Grosjean was recently named as the new deputy head of secondary. During her two day visit to campus, we sat down with Ms. Grosjean to get to know a little bit more about her and her first experiences at DIS. 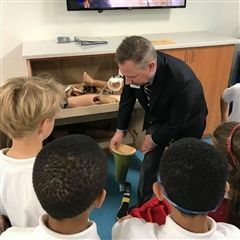 Students from the lower school got a behind-the-scenes tour of the Texas Scottish Rite Hospital for Children, thanks to their fundraising efforts from this year's Rite Race. The $6,800 donation to the hospital was the largest in school history! 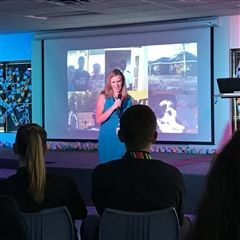 Amy Blankson, a happiness expert who holds degrees from Harvard and Yale, addressed the 8-12th grade students this week and talked about the nature of happiness as part of DIS' "Be Happy" campaign. Learning in the classroom is important, but applying classroom concepts to the real world is where lasting knowledge really takes root! 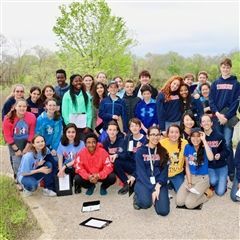 The 8th graders learned this on a scientific field trip to the Trinity River Audubon Center this week, where they learned about the ecosystems in Dallas. At DIS, everyone is learning to speak new languages. 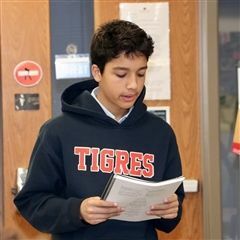 But did you know that some Tigres are even learning to speak English as they assimilate to their new home in Texas? 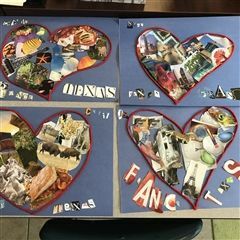 Our awesome ESL students have been working on a special art project to enhance their English and learn more about themselves. 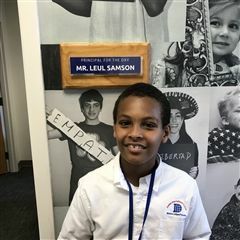 CM1 student Leul Samson had the privilege of serving as the final Principal for the Day on Wednesday, March 21. Principal Samson was a dedicated worker and idea machine, and we managed to get a few minutes of his time to talk about his special day. 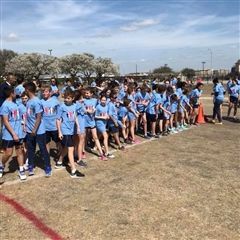 The annual Race for a Cause took place on both campuses recently, with the upper school race helping build schools in Haiti and the lower school race raising funds for the Texas Scottish Rite Hospital for Children. We delved deeper into these special events and how they change DIS students and the greater community. Meditation and mindfulness have been shown to increase students' achievement levels and help them focus better. 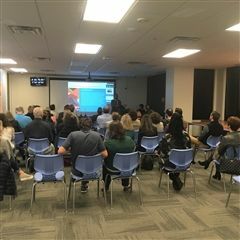 Spearheaded by Nawal Bendefa, a mindfulness professional and DIS parent, DIS will be implementing some of these techniques in a pilot program aimed at middle schoolers. 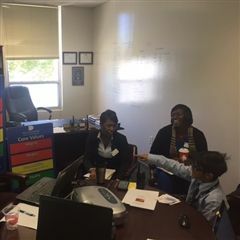 We sat down with Ms. Bendefa to learn more about the program. 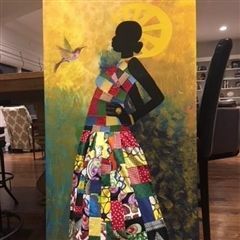 The 2018 Gala class projects were completed and on display on March 1 at the annual Gala Class Project Art Exhibition. DIS community members had the pleasure viewing these beautiful works of art made entirely by students. We learned more about just how much work goes into creating these incredible pieces. Depending on the time of day, DIS senior Calista Fyfe can be found either in the classroom, the art studio or the basketball court. 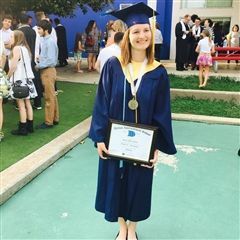 We sat down with this multi-talented student, who has been at DIS since kindergarten, to talk about her experience at the school and her plans for the future. 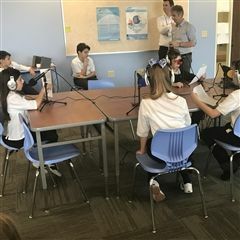 Led by French journalist Thierry Riera, some amazing 5th graders participated in a WebRadio training and recorded their first live radio broadcasts this week! ﻿Did you know that DIS has an advanced afterschool Spanish elective? Ms. Carmen Nelson teaches the class, and students are loving it! 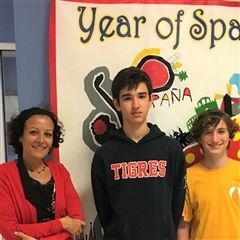 To help perfect their Spanish skills, they watch and analyze Spanish movies, read Latin American news, write essays and so much more. 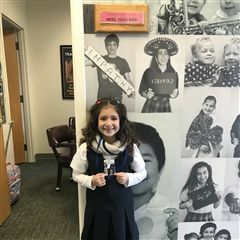 CE1 student Julia Rad had the privilege of serving as Principal for the Day on Wednesday, February 7. She was an energetic and tireless worker, but we managed to snag her for a few minutes in the middle of her busy schedule to talk about her special day. CM1 students recently took a tour of the Waterview campus to learn more about what awaits them in CM2. 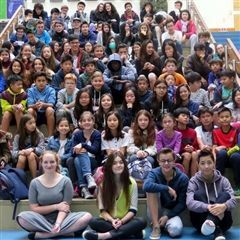 They toured the classrooms, played games, chatted with current CM2 students and viewed their recently-completed science projects. 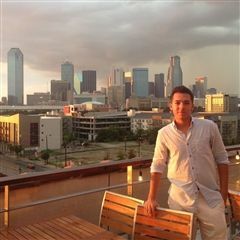 After graduating from DIS in 2012, Sami Reme stayed close to home and attended UT-Dallas for his undergraduate education. His next step? Harvard. 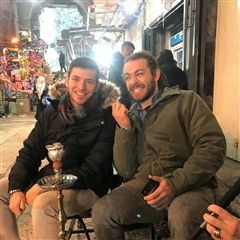 We interviewed the ccurrent grad student and found out what he is up to now at the world's foremost university. 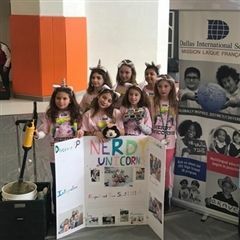 The Nerdy Unicorns Lego League Team, made up of DIS girls in grades CM1 and CM2, continues to roll through its competition. 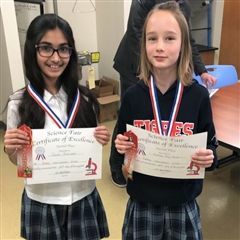 The girls performed incredibly well at the North Texas Regional Semi-Final, showing off their engineering skills and winning some awards along the way. 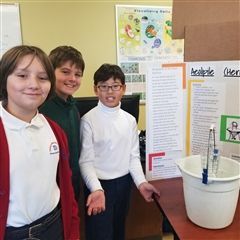 The upper school science fair took place this week, with CM2-9th grade students showing off their creative science experiments to their peers, parents and judges. 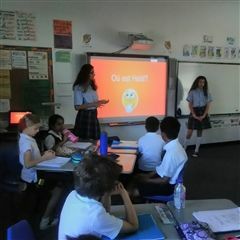 We talked with some of the students about their projects and learned how much work went into them. 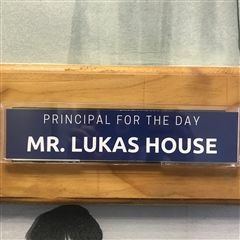 CM1 student Lukas House had the honor of acting as Principal of the Day on Wednesday. 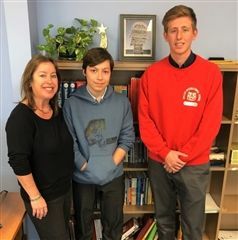 He had the opportunity to attend leadership meetings, make announcements and take phone calls, as well as enjoy a special pizza lunch and extended recess time. We sat down with Principal House to discuss his experience as head of campus for the day. 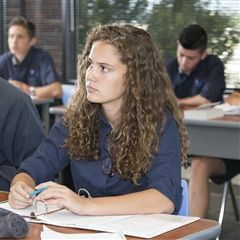 The Language Institute at Dallas International School serves the community by offering foreign language classes for children, adults and corporations. 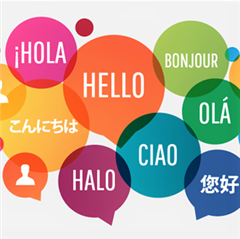 In addition to its usual slate of classes each semester, the Language Institute also offers special classes for DIS employees looking to learn French, English or other languages. 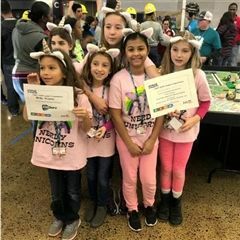 As the Nerdy Unicorn team prepares to participate in their second Lego League event in January, we look back on the girls' accomplishments in their first competition. 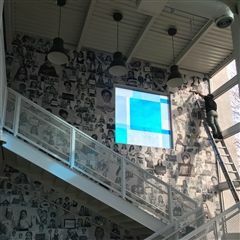 Photographer and artist Jerome Poulalier recently put the finishing touches on his "Picture Our World" project at the Churchill campus. 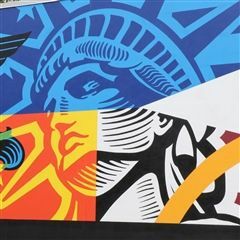 We sat down with Jerome to talk more about the purpose of his piece and what he hopes the DIS community gains from it. More so today than ever, parents are concerned about what their children are taught during their years in school, and this is especially true for parents with children only just beginning the process. 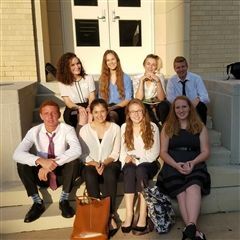 The DIS Model UN team traveled to Waco to compete in their first ever conference. 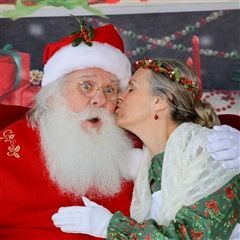 The team was started last school year and trained extensively for this special event. Some DIS students were able to attend a recent speech by Princess Lalla Joumalla of Morocco. Two of the those Tigres in attendance, Courtney Mawet and Noor Siddiqui, wrote about what they experienced as they listened to the Princess speak. Have you met Lynsey Stacks, the DIS nurse? She's one of a kind, and while her main office is at the Churchill campus, she makes sure that all students on both campuses are in tip-top shape when it comes to their health. 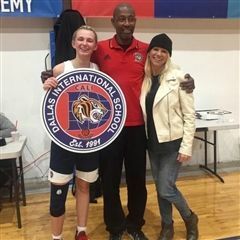 Dallas International School helps prepare children to make lasting relationships in this increasingly global world through its multilingual educational practices. 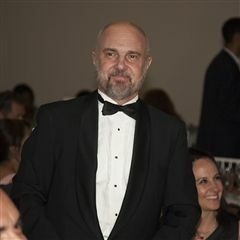 Pierre Mawet is a DIS parent, a business consultant and president of the DIS board of directors. But did you also know he's ridden a bike across the continental United States? We sat down with Mr. Mawet to learn more about him, his family and the goals of the DIS board. 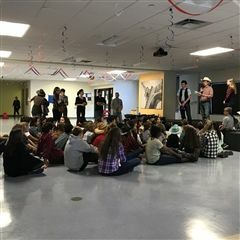 Students at the Waterview campus participated in their first ever House Meetings this week, which marked the beginning of the House System at DIS. 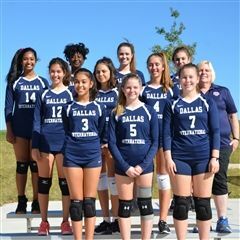 This program, designed to reinforce and increase positive behavior, school spirit and participation, will be a hallmark of Dallas International School this year and in the future. Emre Oguzman has crisscrossed the country since graduating from DIS just a few years ago. Now he's back home in Texas to attend his dream school: UT-Austin. We sat down with him to catch up on what he's been doing and what's in his future. 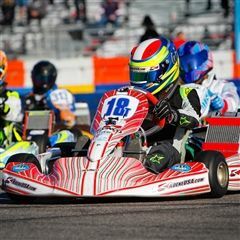 Alejandro Jaramillo is your typical DIS freshman, except for one slight difference: he's a world-class kart racer. 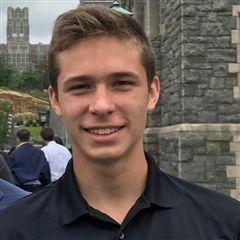 Alejandro is one of the top drivers in his age group and he recently competed in one of the sport's most prestigious races in Le Mans, France. We sat down with him to talk about how he balances his racing career with his heavy academic workload. 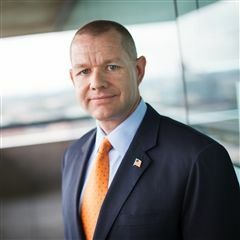 Tomorrow’s big movers are the children we bring into the world today, and it is imperative that each child be given the opportunity to reach their potential. DIS helps every student do exactly that. It is difficult to truly have an understanding of different cultures if you never get the chance to learn about them on a deeper level. Click here to learn more about how DIS offers this opportunity to all of its students! 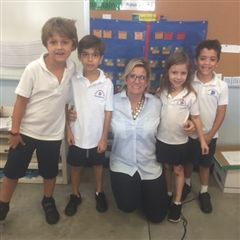 Ever wonder what the Lower School Counselor does or why the Churchill campus needs one? Kelley Loyd, the Lower School Counselor, has been supporting the DIS community since her arrival in August 2014. 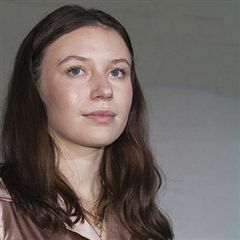 Read more about her here! 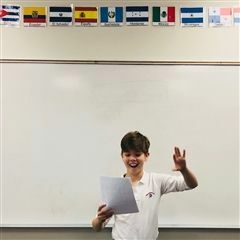 Sebastian Gray was recently informed that he had been selected as a National Hispanic Scholar by the National Hispanic Recognition Program, operated by the College Board. We interviewed Sebastian to learn more about the prestigious award as well as his post-graduation plans. There are many reasons your children will benefit from earning a college degree, especially with so many new career positions opening up with the influx of new technology. This is your child’s chance to not only get started on the right foot, but to ensure they maintain job security throughout their adult lives. Preparation begins now. A large percentage of children are not given enough opportunities to meet and interact with different cultures, languages, and even foods from around the world. Learn how DIS offers its students those very opportunities each and every day. 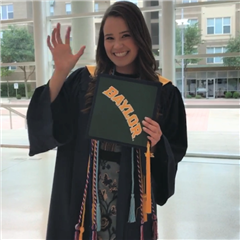 Sonja Greil is a graduate of the Dallas International School class of 2017 and was recently accepted into a prestigious veterinary medicine program in Edinburgh, Scotland. As she prepares for her first semester at university, we sat down with her to learn more about her future plans and past successes as a DIS Tigre. We sat down with Kari Bird, the recipient of the 2017 Outstanding Parent Volunteer Award, to talk about her experiences volunteering at DIS. 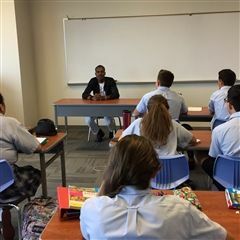 Amos Joseph, a leader with the BuildON non-profit, stopped by the upper school campus to chat with students about the important mission of his organization: building schools in impoverished areas. 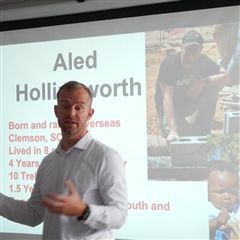 He also discussed the importance of education and how it can change lives. 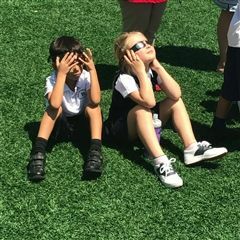 Students and teachers on both campuses had the opportunity to view the solar eclipse on August 21. 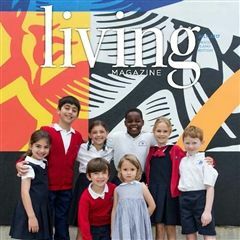 DIS lands on the cover of the July 2017 edition of Living Magazine with a feature story on the unique mission of the school. 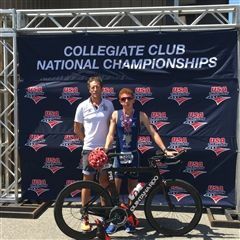 The DIS sophomore has been selected to the national triathlon team that will be competing in the Netherlands in September. 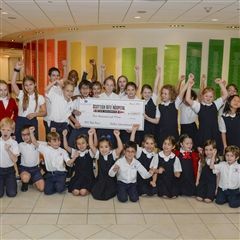 Students from the lower school got a behind-the-scenes tour of the Texas Scottish Rite Hospital for Children, thanks to their fundraising efforts from this year's Rite Race. 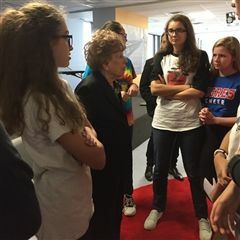 Zsuzsannah Ozsvath, Holocaust survivor and director of the Holocaust Studies program at UTD, spoke to ninth graders about her life experience as a capstone for their study of WWII. 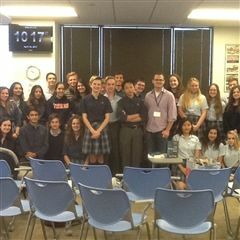 David Tomlinson stopped by the upper campus to discuss his first novel, The Midnight Man, with the DIS English Honor Society. 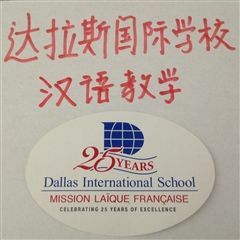 Starting in fall 2017, preschoolers will be able to start studying Mandarin Chinese, thanks to a new partnership between DIS and the Confucius Institute at the University of Texas at Dallas. 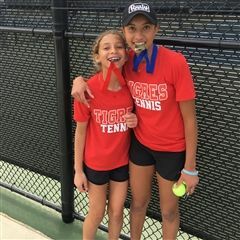 Isabella and Simone Flodin, along with their classmates, shone bright in last week's TAPPS tennis tournaments held at UTD. 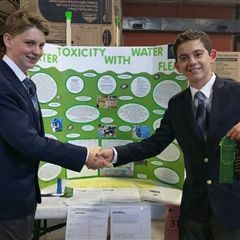 Russell Ramsay and Eddie Ulbricht received a first prize for their science experiment examining toxicity levels in local bodies of water. 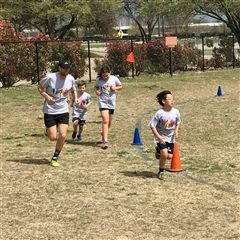 Students on both campuses participated in races to raise funds for a children's hospital and the construction of a school in Haiti. 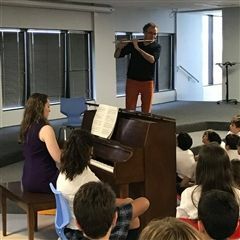 Renowned flutist Jean Ferrandis played traditional French tunes at the upper school, much to the delight of the student audience. 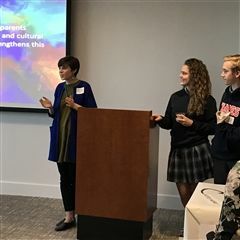 A diversity and inclusion initiative at Hunton & Williams, LLP let DIS students show off their original artwork depicting what it means to be diverse. 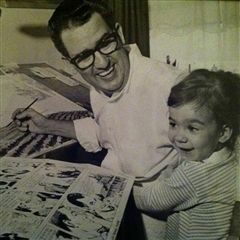 Lorraine Gachelin, the director of community development at DIS, traveled to France to give a conference on her late father, renowned cartoonist Harold LeDoux. 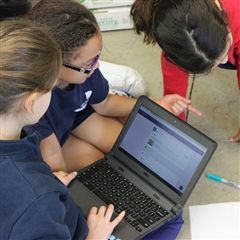 A robotics challenge issued by MLF America helped DIS students push themselves to new heights. A DIS sophomore tells us all about her unique experiences in Taipei. 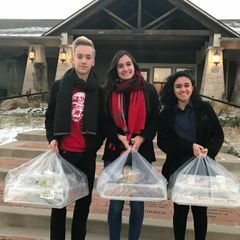 The council reps took food from their cancelled party to City House in Plano. 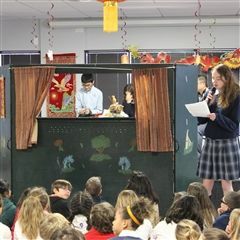 Students in 6th-10th grade put on a cultural show to celebrate Chinese New Year. Alumni Day 2017 saw a host of former Tigres from all over the world return to campus to chat with students and share their life experiences. 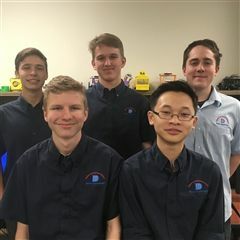 A group of CS students were granted the rare opportunity to attend one of the biggest technology shows of the year. 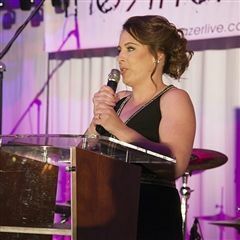 So You Think You Can Chair a Gala? 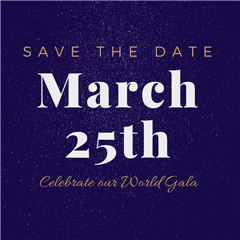 Take a look inside the first steps of putting on the annual DIS gala with our new gala chair. 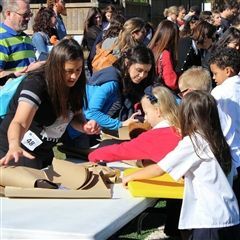 Students at the lower school teamed up with parents and teachers to help children in need for the holidays. 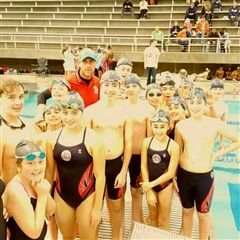 We take a closer look at DIS' first-ever competitive middle and high school swim teams. Ever wondered what it would be like to be principal of DIS? One student found out!